From the day that Eve birthed Cain people continue to be born. Since the day that Cain murdered his brother Abel, people continue to die. Life and death, two absolutes in this life. We are born, we live our lives, and when our bodies either break down and quite on us or a sudden tragedy strikes, our lives are over. No matter our age when we die, life is short. The bible says it is “but a vapor”. For many people their lives amount to not much of anything. They have simply taken up space. Others have contributed in some way to their families or to society while others have left their mark in this world. Few have made great scientific and medical discoveries, intellectual achievements, and invented things that still benefit us today. Then there are those whose lives have only ushered in more evil into the world. I am not afraid to die. I never have been. Life is what was always scary to me. Now that I live for the Lord, life is good, not perfect, but good. I am not looking for fame or notoriety. I don’t want to just exist either and I certainly don’t want my legacy to be one of pain and misery on others. I want my life to count for something. Despite popular belief, we are not some accidental evolutionary occurrence. We have been designed by a great architect. 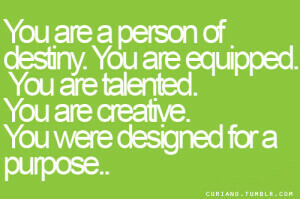 We have been created for a purposely created for a purpose. Each one of us has a reason for being here. God handpicked us for a specific time and place, there is no “accidents” in God’s planning. We can, like Hitler, choose to make our own plans and determine our own future. Hitler chose hell. Every person born into this world has a free will. We are free to choose to follow the path God has laid out for us or to choose to make our own path. Either way there will be hard times, for we live in a fallen world and real evil does exist. But when we determine to walk on the path that he has for us, every bad situation is turned around for our good. Even when we stumble or get off the path, He extends His hand of love and helps us back up and back on the right track. Our lives are not without purpose. We can either accept that purpose and strive to be all God has created us to be, using our gifts and talents for His glory, or we can reject His purpose. 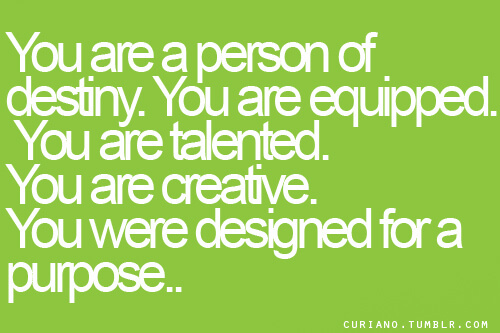 It encourages me to think of those imperfect, messed up, people who went on before me and fulfilled their purpose. I still have to remember those like Hitler; they remind me of the evil that is always crouching at the door looking for an opening to come in. However, remembering the Mother Theresa’s, the William Wilberforce’s, and the Mildred Cable’s of this world. Then there are the countless people who quietly live their lives and are barely noticed by anyone save their families and friends who live right, serve their community, love their families and live for God. The world may never know them or recognize what they do, but God is paying close attention. He is storing up rewards for them in heaven and He is pouring out His bounty on them now. Some will suffer for Him and others will lose their lives, but their lives will count! This entry was posted in Thoughts and tagged a life worth living, Bible, christian, Christianity, created, creator, destined for greatness, faith, God, God's love, God's word, Holy Spirit, Jesus, living with purpose, love, my destiny, trials.